I really enjoyed making a list of bookish goals last year, so I thought I'd do it again for 2014. First, though, I thought I'd give a short report on how keeping 2013's resolutions went. I'm proud to say that I didn't go overboard with my library borrowing last year. I only took out what I could reasonably read in a few weeks. It's actually been a long time since I went on a library spree, so now I feel like I've earned one. Just one, though. I did so-so with tackling my unread books at home. I read a few, but I could have read more. Quite a lot more. Reading what I already own is going to be my focus for 2014, and it's the main reason why I signed up for the 2014 TBR Pile Reading Challenge. In 2013, I reached a point where I was so busy with non-book related stuff that I just didn't have time to stress out over whether the blog had x posts for the week or if it had gained any followers or how many page views it had in a month. For the sake of my sanity, I really needed to quit worrying about those things, so having less time for blogging has turned out to be a plus in a way. While of course I'd love to see the blog continue to grow, I've pretty much stopped thinking along the lines of, "the blog needs to have this stat reach that number in blah blah months." I've found I'm much happier reading and blogging at my own pace, whatever that may be at the moment. Moving on to what I hope to accomplish this year, the big blogging goal is switching to WordPress. I know I've been blathering on about it for ages now, but if I can only get one blogging related task done in 2014, it's this one. Making the jump scares me a bit, and part of me is probably holding back out of fear of something going terribly wrong, but I need to just set aside some time entirely devoted to this and do it. Reading-wise, there are a couple of series that I'd like to reread. It really bothers me that the archive only contains a review of City of Lost Souls and not the first four Mortal Instruments books, which I read pre-blog. With the last book coming out this year, I think this is a good time to revisit books 1-4. It's been so long since I read Daughter of Smoke and Bone, another pre-blog read, that I think a reread is in order before attempting Days of Blood and Starlight. I'd love to do a reread of the Harry Potter books, too, but with these other rereads taking shape, HP might have to wait a bit before I end up doing an entire year of rereads . . . . I'm really excited to begin a new reading/blogging year. I may read fewer books and write fewer blog posts this year, but I'm okay with that. Have you made any bookish resolutions for 2014? I'd love to hear about them! Congrats to your relaxed approach!!! I've never really worried about stats too much - I just still get really excited about every comment on the blog :) But honestly, blogging is so much more fun when it's done from scratch, a bit more of real life spontaneity instead of planning three months ahead!! Just posting when I can has been so refreshing. I don't think I realized how much pressure I was putting on myself to stick to a schedule until I didn't have the time to plan more than maybe a week ahead at the most. Not worrying about logistical things so much has really put the fun back into blogging for me. I have toyed with moving to Wordpress, love the plugins, so have been reading Nose Graze on the issue, however might leave it for 2015, but will follow your progress with interest. I started looking into moving last year but then got so busy with life outside of books and blogging that I think I'm going to have to start researching from scratch, lol. The plugins are definitely a huge pro of using WordPress, and I love the idea of self-hosting, even with the extra work involved. I love your goals!! I think not stressing over the blog is vital for bloggers that have way too much stress going on in other areas. Just let it be a release and fun thing. 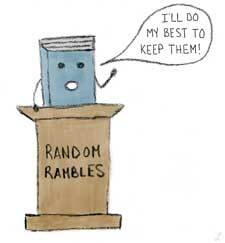 I love visiting your blog :D I think the TBR Challenge sounds like the way to go this year. I failed miserably at the Paranormal Reading Challenge since I just quit about 4 months ago. The re-read thing is a must for me as well. I have a lot of pre-blog books that I'm always talking about on my blog, but there are no reviews anywhere on goodreads or my blog for them so I feel like people don't really know how I feel about all of them. Good luck :D Jaclyn @ JC's Book Haven. I didn't do well at all with the Paranormal Reading Challenge or the Sequel Challenge last year. The TBR Pile Challenge seemed like one I could handle because I do read a lot of older titles, so I'm giving it a go. It's also a great challenge to motivate me to get some of my rereads done. I love daughter of smoke and bone! I love wordpress..so easy to use and to socialize on! I'm really hoping to reread Daughter of Smoke and Bone so I can refresh my memory and review it and then finally get to read Days of Blood and Starlight before the new book comes out! Going back to basics is a process right? I'm still in that process now but I think I'm in the tail end of it. Skipping tours and stuff is my Step 1 and next is purging my TBR by going cold turkey on ARCs. Good luck on the move, I'm staying put just because I have no idea how I'd be able to do that if I attempt it. If you do it successfully, know that I will be bugging you with the "how to's"
If all goes well with moving and I live to talk about it, I'd be more than happy to help, lol. Good luck with going cold turkey on the ARCs! I'm going to try and really focus on what's been sitting on my shelves for far too long; I have some seriously neglected books at home! Thank you! <3 I'm so happy that we've both been able to still find time for blogging, too! It's become such a big part of my life, and though I don't have the time for it I used to, I'll take whatever time I can devote to it over none at all. And I need to get a move on the DoSaB reread; April will be here before I know it!